Vegetarianism first became established in the UK in the middle of the nineteenth century with the formation of the Vegetarian Society. From its origins as a diet that simply excluded meat it has since evolved a number of different permutations. 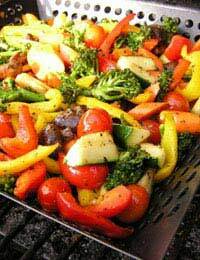 Most vegetarians continue to eat animal products that do not require the death of the animal to produce. Hence, eggs, milk and cheese are usually considered acceptable. However there are vegetarians who specifically omit dairy or eggs from their diet and there are those, sometimes called pesco-vegetarians, who supplement an otherwise vegetarian diet with fish and seafood. Traditionally, vegetarianism has often been associated with religious belief. Hinduism, Islam, Judaism and Buddhism all have followers who refuse to eat meat for one reason or another. In modern times, the new ideology of environmentalism is encouraging more and more people to consider switching to a meat-free diet in order to reduce the pressure on agricultural systems that are already strained to bursting point. Many otherwise excellent restaurants give little or no consideration to vegetarian diners, often only grudgingly turning out a bowl of bland tomato pasta when pushed to do so. Despite the scorn of celebrity chefs whose businesses traditionally depend on large numbers of meat-eating patrons, vegetarian cuisine has come on leaps and bounds since the first TVP (textured vegetable protein) began appearing on supermarket shelves. One of the most common mistakes made by non-vegetarian cooks preparing a meal for vegetarians is to assume that it must include some foodstuff that is a direct substitute for the missing meat. This approach ignores the profusion of delicious recipes that come from all over the world that were designed to function entirely without a meat component. The many vegetarian curries of India are an excellent example. Mushroom risotto, ratatouille and refried beans are other dishes that require no meat at all to be tasty and satisfying. Falafel has become the global superstar of vegetarian fast food. When it is prepared well and plays to its inherent strengths, vegetarian food should have no need of meat or anything like it. Some of the most spectacular vegetarian dishes feature stuffed vegetables. Almost any large and reasonably sturdy vegetable can be used, bell peppers and butternut squash are particularly good when roasted, and courgettes and carrots can be hollowed out into canoes. When it comes to the stuffing itself, mushrooms braised in red wine and mixed with caramelised onions and toasted pine nuts provide an amazing range of flavours and textures. The striking visual aspect of such a dish is an essential part of its appeal. One of the most common complaints about the processed vegetable proteins available as meat substitutes is their lack of flavour. This can be a problem, but it is relatively easy to add flavour to them by marinating in herbs and spices or simply by allowing them to cook in the pan for a while with a stronger tasting food whose flavour they can absorb, such as onions. A simple rub made with dried herbs, mustard, raw garlic and black pepper can also provide a potent flavour for vegetarian fillets, especially when applied the day before cooking. Iron is an important mineral that vegetarians must be careful to ensure they do not miss out on. Many beans, seeds and nuts contain iron in abundance however, so there is very little risk of anaemia with any reasonably varied vegetarian diet. When cooking vegetarian food, there is no need to be bound by conventional wisdom about what dinner should look like. It is perfectly possible to have a healthy and balanced diet without ever eating meat and there is far greater diversity of flavour and texture available in the vegetable kingdom than there is in the animal one.